It’s Halloween, and you’ve probably noticed spiders everywhere. And not just the ones in costume. Spiders are out in full force in the fall because they have a lot to do. They mate, lay eggs and die, leaving the next generation to take over the world in the spring. Perhaps the most seasonal of Bay Area spiders is the “pumpkin spider,” which gets it name from its bulbous, rust-colored thorax and is particularly active around Halloween. Also called the European garden spider or cross orb weaver, the pumpkin spider is an introduced species from Europe, but relatively harmless to the ecosystem. It’s considered “holarctic,” meaning its range spans much of the northern hemisphere. Orb weavers in general account for approximately 25 percent of spider diversity, and there are probably more than 30 species in the Bay Area, said Charles Griswold, the arachnids curator at the California Academy of Sciences. Most orb weavers kill their prey with poison, but none are dangerous to humans. “Orb weavers are always around, you just don’t notice them until they grow big,” Griswold said. The pumpkin spider, Araneus diadematus, is a pretty versatile critter: it likes gardens, farms, orchards, suburban and urban areas, the edge of forests, waterways — you name it. You can even find the youngsters “ballooning” outside skyscrapers, where they catch the wind and sail to new territory on their silken threads. A few fun facts to give a full sense of wonder about these eye-catching arachnids. It’s one of the few orb weavers regularly found at all stages of development. 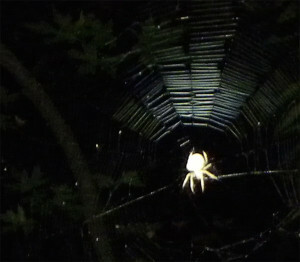 It eats its web every night in order to recycle the proteins and water to rebuild a new web. The males mature more quickly and sometimes pair up with immature females to wait for them to mature. Other spiders you might see at this time of year are the silver garden spider, Argiope argentata, which can be identified by its distinctive “X” shape and silver hue. While the majority of male spiders reach maturity, few females do. Mature females often dine on the males after mating. And of course, fall is tarantula mating season, when the hairy beasts crawl up from their burrows in the ground to find each other and procreate. Although they are the largest spiders in the world, tarantulas are fragile, have poor eyesight, and their bite is on the order of a bee sting. The main species of tarantula found in Northern California is the Bay Area blond tarantula, Aphonopelma smithi, which takes seven years to reach puberty and is generally skittish and easily disturbed. Mount Diablo and some of the drier parks of the East Bay are prime tarantula territory. The other tarantula species found in the region is Aphonopelma iodius. Ask the Naturalist: Where Has “Charlotte” Gone?